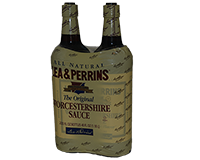 Lea & Perrins introduced Worcestershire sauce in 1835, and the product with the often mispronounced name has emerged as a staple in restaurant and household kitchens around the world. Add 1/3 cup of Lea & Perrins Worcestershire Sauce to your favorite meatloaf recipe. Add 1/4 cup of Lea & Perrins Worcestershire Sauce per 1lb of ground beef for a delicious hamburger. For great tasting steaks, marinate in 3/4 cup of Lea & Perrins Worcestershire Sauce. Ingredients: Vinegar, Molasses, High Fructose Corn Syrup, Anchovies, Water, Onions, Salt, Garlic, Tamarind Concentrate, Cloves, Natural Flavorings, Chili Pepper Extract. Potato Chip Dip More Recipes..